SpaceX launched Luxembourg’s first military spacecraft on Wednesday, with a flight-proven Falcon 9 carrying the GovSat-1 communications satellite into geosynchronous transfer orbit. Liftoff from Cape Canaveral’s Space Launch Complex 40 was at the start of a 121-minute window that opened at 16:25 Eastern Time (21:25 UTC). Amazingly, the booster survived a water landing, despite the return not involving the drone ship. 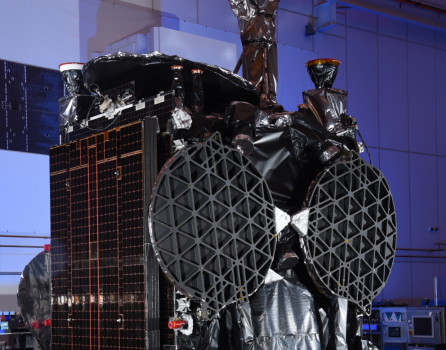 GovSat-1, also known as SES-16, is the first satellite to be launched for LuxGovSat, a partnership between the government of Luxembourg and commercial satellite operator SES. The satellite will provide secure communications for Luxembourg’s military and the country’s allies, as well as supporting civilian government applications. The launch was the fifth time SpaceX has deployed a payload for SES. Falcon 9’s first geosynchronous launch carried the SES-8 satellite to orbit in December 2013, while a March 2016 launch deployed SES-9. The launch of SES-10 last March marked the first re-flight of a previously-flown Falcon 9 first stage, with another re-used Falcon 9 used to deploy SES-11 in October. This launch again used a flight-proven booster. The SES-16/GovSat-1 satellite is one of three which SES first announced in February 2015, along with SES-14 and SES-15. 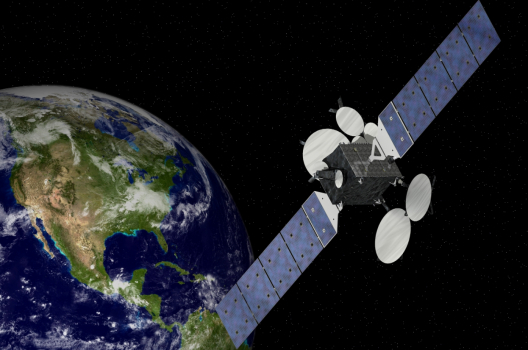 Orbital ATK was contracted to build GovSat-1, which is based on the new GeoStar-3 bus. The satellite has a mass of about 4,230 kilograms (9,330 lb) and is expected to operate for at least fifteen years. Orbital ATK’s GeoStar 3 bus. The spacecraft’s propulsion system consists of a single IHI Aerospace BT-4 liquid apogee motor and four Aerojet Rocketdyne XR-5 Hall-effect ion thrusters. The satellite will be powered by a pair of deployable solar arrays. GovSat-1 was the second satellite based on the GeoStar-3 platform to launch. The first, the Al Yah Satellite Communications Company’s Al Yah 3, was launched last Thursday atop an Ariane 5ECA rocket which was also carrying SES-14. The Ariane 5 placed both of its payloads into an off-nominal inclined orbit, although both satellites are still expected to be able to reach their planned final geostationary orbits. SES-15 was launched successfully by a Soyuz rocket last year. The communications payload aboard GovSat-1 consists of X-band and Ka-band transponders, incorporating anti-jamming capabilities, with bandwidth equivalent to sixty-eight 36 megahertz units. The spacecraft will be situated in geostationary orbit at a longitude of 21.5 degrees East, providing coverage of Europe, Africa and the Middle East, as well as the Atlantic and Indian Oceans and the Mediterranean and Baltic Seas. As well as serving military applications for Luxembourg and its allies, including NATO, GovSat-1 will also be used by Luxembourg’s government to support disaster recovery and emergency response operations, to facilitate cooperation between civilian and military agencies and to provide communications for government offices in remote locations. SpaceX used a Falcon 9 rocket to conduct this launch. Falcon 9’s forty-eighth flight, the GovSat-1 mission saw the rocket fly in the Falcon 9 v1.2 – or “Full Thrust” – configuration. It was the sixth Falcon 9 mission to incorporate a previously-flown, or “flight-proven” booster – that is a first stage that has been recovered and refurbished following a previous launch. Falcon 9 is the only rocket currently flying that is designed to be partially reusable, with the rocket’s first stage – also known as the Core or Booster – capable of making a powered landing either back at the launch site or downrange aboard an Autonomous Spaceport Drone Ship (ASDS). On missions where the first stage is to be recovered, it flies equipped with deployable landing legs and grid fins to facilitate a controlled descent and landing. The first stage that was used for this launch, Core 1032, was first flown last May when it helped to boost the NROL-76 payload into orbit for the National Reconnaissance Office, in what was Falcon 9’s first dedicated launch for the US military. After completing its role in the low Earth orbit launch, Core 1032 made a successful landing at Cape Canaveral’s Landing Zone 1. Core 1032 was not recovered following this mission. As with December’s Iridium-NEXT launch, SpaceX will dispose of the older Block 3 booster by flying it in an expendable configuration, despite still sporting landing legs. New-build Falcon 9 boosters are currently using the more capable Block 4 configuration, while the first Block 5 vehicles are expected to fly later this year, and SpaceX appears to have opted not to recover cores that would be unlikely to ever fly again. 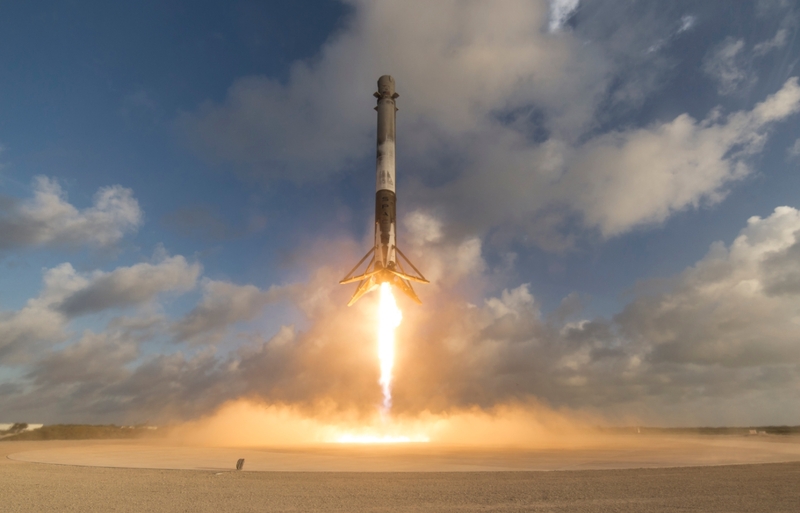 Despite not attempting to land the stage, SpaceX may still use Core 1032 for recovery demonstrations – such as a controlled water landing – after separation. This turned out to be the case, but more surprisingly, the booster survived the test. SpaceX is also aiming to make the Falcon 9’s fairing – which protects the payload as it ascends through the atmosphere – reusable. To this end, the company has been conducting a series of tests with the fairings following separation on operational missions. Two ships that often support these operations, the Go Searcher and Go Quest, have put to sea in advance of this launch, although it is unclear whether these were involved in a fairing recovery attempt or supporting the launch in another way. The Mr Steven, another ship equipped with arms to carry a recovery net, remains on the West Coast and will not play a role in the GovSat-1 mission. This mission lifted off from Space Launch Complex 40 (SLC-40) at the Cape Canaveral Air Force Station on Florida’s Space Coast. SLC-40 is one of two SpaceX launch complexes on the East Coast of the United States, along with Launch Complex 39A at the nearby Kennedy Space Center. SLC-40 was originally built in the 1960s as a Titan IIIC launch pad, part of Titan’s Integrate-Transfer-Launch (ITL) complex. It was later used by Titan III(34)D and Titan IV rockets, before SpaceX leased the facility in 2007. The pad was used for Falcon 9’s maiden flight in 2010 and many of the rocket’s early launches, before it was damaged when a Falcon 9 exploded during fuelling for a static fire test ahead of the planned launch of Amos 6 in September 2016. 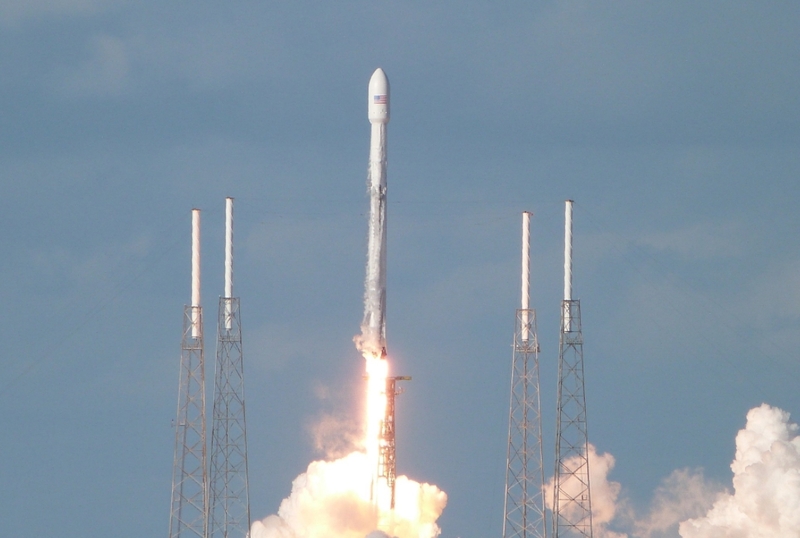 Following over a year of repair work, SLC-40 returned to service in December with SpaceX’s CRS-13 launch, and also supported the Zuma mission earlier this month. 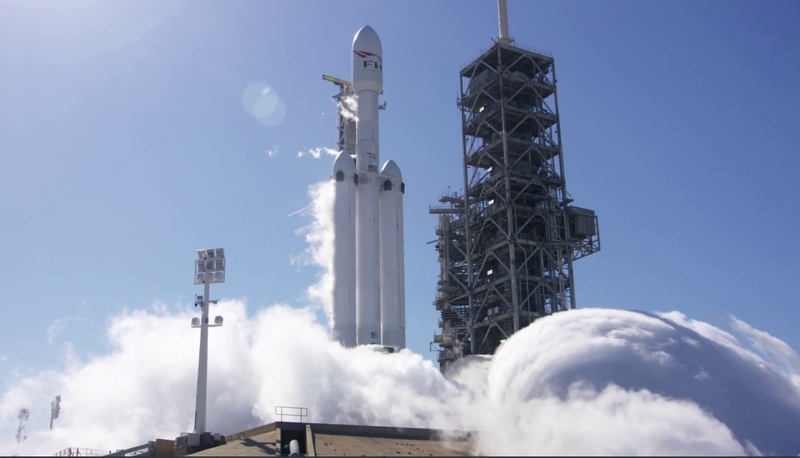 Its reactivation has allowed SpaceX to proceed with final modifications at LC-39A ahead of the first Falcon Heavy launch – currently scheduled for early next month. Falcon 9 is a two-stage rocket fuelled by RP-1 propellant which is oxidized by subcooled liquid oxygen. The rocket first flew in June 2010 and has completed 47 launches to date with one failure. These numbers do not include the Amos 6 accident, which did not occur during a launch attempt. The Falcon’s first stage is equipped with nine Merlin-1D engines. These ignited at the three-second mark in the countdown, with Falcon 9 lifting-off at T-zero. 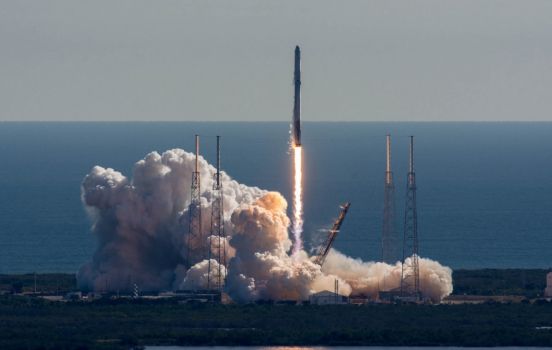 Climbing away from Cape Canaveral along an easterly trajectory, Falcon passed through the area of maximum dynamic pressure – Max-Q – seventy-eight seconds into flight. The first stage – Core 1032 – powered Falcon 9 for the first two minutes and 38 seconds of the mission. The mission then reached Main Engine Cutoff (MECO), the point at which the first stage engines shut down in preparation for stage separation. The stages separated two seconds after MECO, with the second stage igniting one second later. The second stage uses a single Merlin Vacuum (MVac) engine, a modified Merlin-1D which is optimized to deliver peak performance in the vacuum of space. It made two burns to deliver GovSat-1 into orbit – the first of which lasted five minutes and 54 seconds. Falcon’s payload fairing separated sixty-three seconds into the first burn. 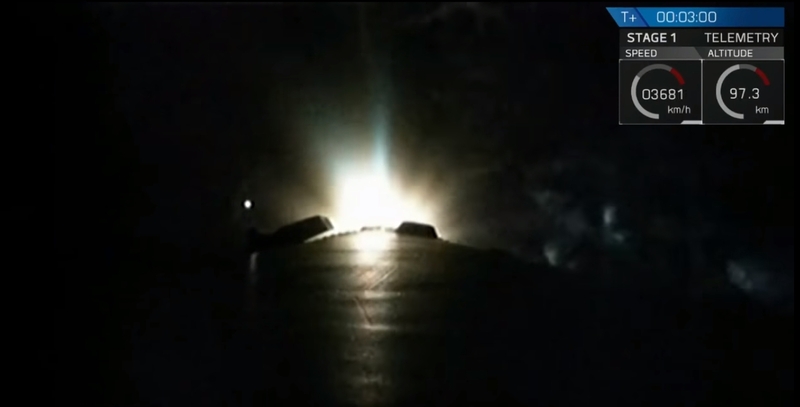 After an eighteen-minute, five-second coast phase, Falcon 9’s upper stage restarted for its second burn. This lasted sixty-eight seconds, placing GovSat-1 into its planned geosynchronous transfer orbit. Spacecraft separation came four minutes and 31 seconds after the end of the second burn – at thirty-two minutes and 19 seconds mission elapsed time. The launch was SpaceX’s second of the year, following their launch of the secretive Zuma satellite for Northrup Grumman earlier this month. Although Falcon 9 performed nominally during that launch, the satellite has not been observed in orbit and is rumored to have failed to separate and subsequently been deorbited along with the rocket’s upper stage. Although separating its payload is normally a function of the rocket during launch, it has been reported that for the Zuma mission the separation mechanism was provided by Northrup Grumman as part of the payload. The next scheduled launch for SpaceX will be the maiden flight of the Falcon Heavy rocket, currently scheduled for 6 February. The next Falcon 9 is scheduled for liftoff from Vandenberg Air Force Base sometime after 10 February with Spain’s Paz radar imaging satellite, while the rocket’s next East coast mission will take place a few days later with HispaSat 30W-6. SpaceX will conduct another mission for SES later this year, with the SES-12 satellite due to lift off aboard a Falcon 9 in April.